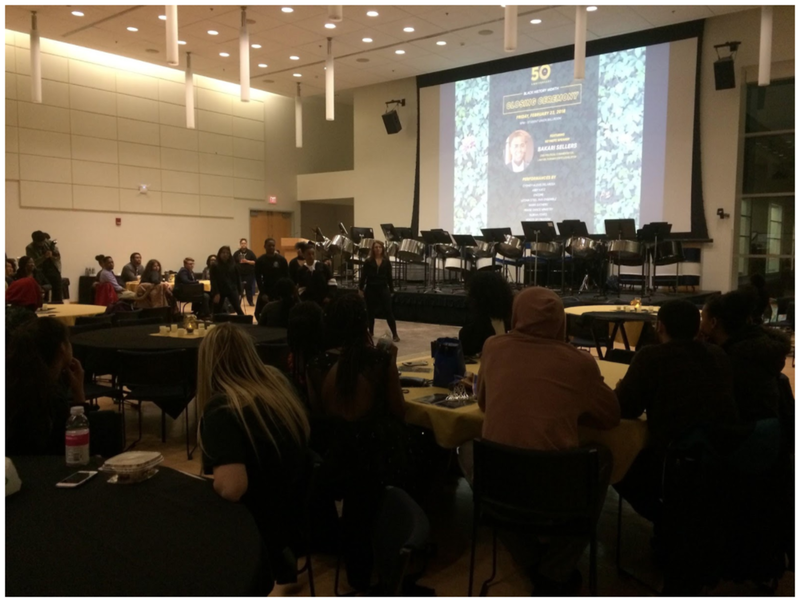 The Student Union Ballroom was decorated in yellow and black on Friday for the Closing Ceremony of Black History Month. With performances from a number of black students and cultural groups on campus, the night aimed to highlight black talent and black excellence before introducing the keynote speaker, CNN political commentator, lawyer, and former state legislator Bakari Sellers, who spoke to how the position of black Americans has changed and how it should continue to change. Sellers answered these questions by talking about a number of landmark court cases and highlighting individuals who had incredible but understated impacts on the civil rights movements, such as George Elmore, Sarah Mae Flemming and the parents in Clarendon County, South Carolina. While not undermining the work that has been done, Sellers focused on looking forward to the next steps that need to be taken. At the end of the night, second semester ACES student Ashley Prawl cited Seller’s speech as her favorite part of the evening. “It really inspired me to work harder and to do whatever’s necessary,” Prawl said. Preceding the speech, the first segment of the night presented a lot of black culture, not only through a number of musical performances, but also through the presentation of Sheroes and Heroes and the work of the MCs. “I just came tonight to be inspired to embrace my black culture,” Prawl said. Sixth semester cognitive and political science major Odia Kane and sixth semester communications major Keith Guerrant presented the Sheroes and Heroes slideshow, which featured black figures such as Michelle Obama, Sojourner Truth, Dorothy Height, Thurgood Marshall, W.E.B. DuBois and Colin Kaepernick. The MCs, first semester biology major Dejara Queen Mitchell and sixth semester communications major Patrice Mcinnis also used a transition segment to ask the audience some of the ways they tried to exemplify black excellence. A number of dance’s were featured as well, including sixth semester food, culture, sustainable society and human rights major Abby Katz’s tap dancing, and performances by UConn Encore, UConn Praise Dance Ministry and the Nubian Foxes. The UConn Steel Pan Ensemble played as well. The Closing Ceremony wrapped up a month that had already seen a number of similar performances.